Quick overview A unique, combined perspective on how therapy is conducted, what works and what doesn't work in treatment, and how to take care of oneself as a clinician. This book provides students and novice clinicians with nuts-and-bolts advice about the process of doing therapy, starting with the first contact with a new patient. 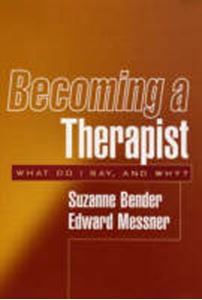 Suzanne Bender, at the time a junior clinician, and Edward Messner, a seasoned practitioner and supervisor, provide a unique, combined perspective on how therapy is conducted, what works and what doesn't work in treatment, and how to take care of oneself as a clinician. Organized around the treatment of one fictitious patient, with other case examples brought in as needed, the book speaks directly to the questions, concerns, and insecurities that beginning therapists typically face. Written with candor and empathy, it offers authoritative guidance for understanding and resolving common clinical dilemmas.